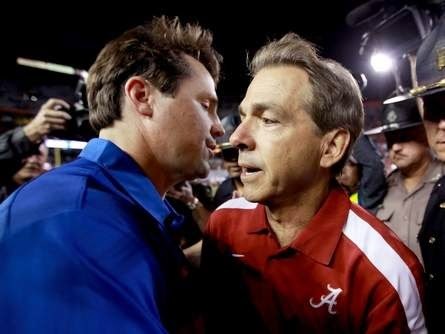 Shirts With Random Triangles: Nick Saban gives Will Muschamp a show of support. Will Muschamp and Nick Saban. Photo via The Gainesville Sun. Will Muschamp hasn't had the easiest of time since becoming head coach of Florida three years ago. He's 22-16 over three seasons, has yet to beat Georgia, and went 4-8 in 2013, including an embarrassing loss to Georgia Southern. Many Gator fans, needless to say, wish Muschamp was an ex-Gator coach. With that in mind, Muschamp got a big show of support from Alabama head coach Nick Saban, who believes Muschamp can stop the bleeding in Gainesville. Muschamp was a former assistant coach to Saban at LSU. “I have a lot of respect for Will,” Saban said. “He’s a great coach and I think he’s doing a really, really good job. Sometimes you have a tough year, you get a lot of players injured like (the Gators) did, lost their starting quarterback. “When you have those those type of circumstances, it becomes more difficult for your team to reach the potential they once had. I think he will respond extremely well. Saban also declared Muschamp to be a "fantastic competitor," and a "mature guy." Saban and Muschamp will face off against each other on Sept. 20, when the Gators travel to Bryant-Denny Stadium to face the Crimson Tide. The last time the two coaches and their respective teams faced each was in 2011, when the Tide beat the Gators 38-10.